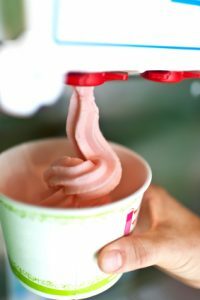 I personally LOVE the various toppings that we can choose from at these DIY froyo places and would never place a limit on myself in terms of which toppings I can have and how many toppings I can choose from. Usually what I do is put a small base of french vanilla fro yo in the bottom of my bowl, then top it with berries and angel food cake and whipped cream. Then I put another layer of froyo in, usually more vanilla, but sometimes I experiment here. Then I top this layer with brownie bites, reese’s, etc and polish it off with some PB topping. This way it is like two desserts in one. I get the chocolate/indulgent taste I want, and then can finish it off with some sweet fruit. In my opinion, when I go to these places it is a treat and a very occassional indulgence. Therefore, I see no reason to have “rules” surrounding what I can and cannot have. If this was a more common place I ate at, then yes I would restrict myself, but since it is not, Good-by rule book! I can’t resist all those yummy flavors and cross my boundary line twice a month but that’s it. I make up for it the later on 🙂 I love your post! Have any of you guys seen that thing that makes bananas into ice cream? I think it’s called GoNanas or YoNanas or something like that. Looks amazing! Yogart is my favourite in Breakfast.